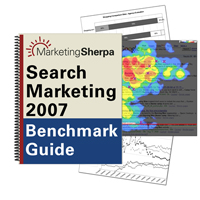 There are tons and tons of useless data out there when it comes to SEM, but as far as I'm concerned there is only one SEM Bible, and that is the MarketingSherpa Search Marketing Benchmark Guide. I just received my 2007 copy this week, and it's the best $247 I'll spend. The value of this guide, IMO, is not the commentary that the editors include alongside the data they've collected, but rather the data itself and the thoroughness with which they've assembled a good part of what's valuable into one tome.